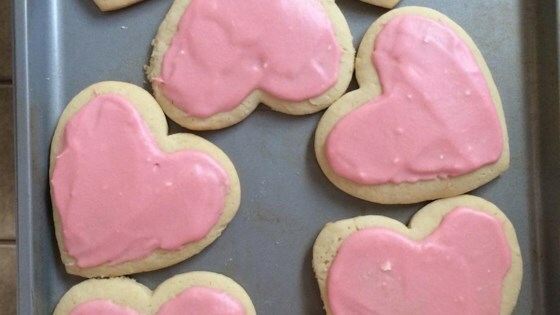 "These taste just like Loft House sugar cookies and are just as soft." Beat vegetable shortening, white sugar, 1/4 cup milk, eggs, and 1 teaspoon vanilla extract together in a bowl. Whisk flour, salt, and baking soda in a separate bowl. Slowly beat flour mixture into shortening mixture to make a smooth dough. Roll dough out 1/4-inch thick on a floured work surface and cut into shapes. Arrange cookies on baking sheets. Bake in the preheated oven until cookies are firm, about 10 minutes. Let cool. Beat butter, confectioners' sugar, 1 1/2 teaspoon vanilla extract, and 2 tablespoons milk in a bowl with an electric mixer on high speed until frosting is spreadable and slightly fluffy. Frost cooled cookies. I find it better to use round shapes or large shapes without a lot of detail to make the cookie stay soft. Definitely a keeper. For the comments the batter was too sticky, I put in it the fridge for about 30 minutes. Stiffened it up and the rolling was easy. Thank you! AWESOME!! !I just plopped down 2 Tbls of dough, per cookie, onto a baking sheet and baked them that way ! They are SOOOOO yummy!!!! I will definatley make this recipe over and over again!